FILE - Zimbabwe opposition leader Morgan Tsvangirai speaks to the Associated Press after giving a news conference at his home in Harare, Zimbabwe, Nov. 16, 2017. If Zimbabwean opposition leader Morgan Tsvangirai were to stand down, as he has hinted he might, the party he founded would face immediate instability and could even split, handing a gift to new President Emmerson Mnangagwa in an election this year. The most visible opposition figure in the southern African nation since independence from Britain in 1980, Tsvangirai said Monday it was time for the older generation to make way for younger leaders in the party. Mnangagwa, 75, rose to power last November after Robert Mugabe stood down following a de facto coup, ending a 37-year reign marked by economic mismanagement, corruption and vote rigging allegations. Investors and Western governments who cheered the end of Mugabe's rule will be closely watching the election for evidence Mnangagwa can run a free and fair vote and turn a new page in Zimbabwe's history. It was expected that Tsvangirai's Movement for Democratic Change (MDC) would pose a robust challenge to Mnangagwa's ruling ZANU-PF. But that prospect may now be in jeopardy. Tsvangirai, who has been battling cancer for several years and looked frail at a meeting with Mnangagwa last week, did not explicitly say he would stand down, and his spokesman said he could not comment further. Tsvangirai, 65, has three deputies, one who was elected and two others he handpicked in 2016 to help him run the party, a move that still irks some MDC members. The MDC has known division twice before — in 2005 and in 2014 following a heavy election defeat to the ZANU-PF. And, though analysts said it was good in the long term for Tsvangirai to relinquish the MDC leadership after nearly 20 years in charge, the succession has to be handled carefully. "Behind the scenes, the three party vice presidents are gladiating to take over from Tsvangirai," said Eldred Masunungure, a political science lecturer at the University of Zimbabwe. "It should be a democratic process and not an autocratic change of power. If Tsvangirai takes that route, it will tear the party asunder. It will be a sad day if Tsvangirai's departure means the death of the MDC." FILE - Officials join hands at the signing of the power-sharing deal in Harare, Zimbabwe, Sept, 15, 2008. 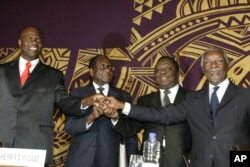 From left: Arthur Mutmbara, deputy prime minster; Robert Mugabe, president; Morgan Tsvangirai, prime minster; and Thabo Mbeki, South Africa's president. The MDC has weakened progressively since 2008, when Tsvangirai defeated Mugabe in the first round of voting. After opting out of the runoff, alleging violence by the army against its supporters, the MDC formed a unity government with ZANU-PF that helped stabilize the economy until Tsvangirai was defeated in a 2013 presidential election by Mugabe. A senior MDC official said Tsvangirai was still considering whether to call for a special leadership congress or have the party appoint a new presidential candidate. "The MDC is at a very critical moment and the issue of transitioning to a new leader has been weighing heavily" on Tsvangirai, the MDC executive told Reuters, asking for anonymity because of the sensitivity of the issue. Tsvangirai, 65, the self-taught son of a bricklayer who worked in a rural mine to support his family, cut his political teeth in the labor movement as a mine foreman, later becoming a top trade unionist. In 1999 he was elected founding MDC president and built his political career as a one of the only people willing to stand up to Mugabe, making him difficult to replace. He will have to juggle regional, tribal and gender considerations in looking for a successor. "Those are salient issues that the MDC cannot run away from," said Masunungure.